It’s been unseasonably warm this winter/early spring, which means unusual progress has already been made in the yard. 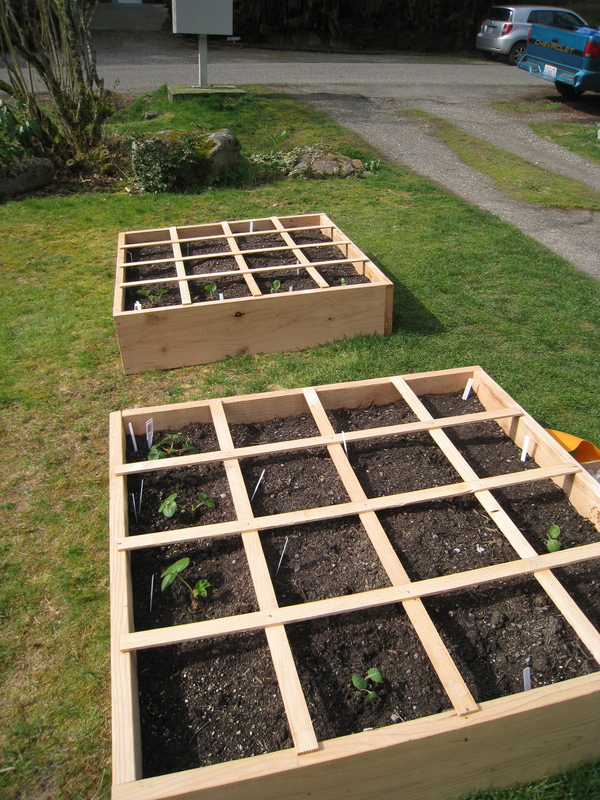 The Geek built these lovely raised beds, so we could attempt our first vegetables. We’ve planted some peas, poppies, and sunflower seeds, but no seedings yet. 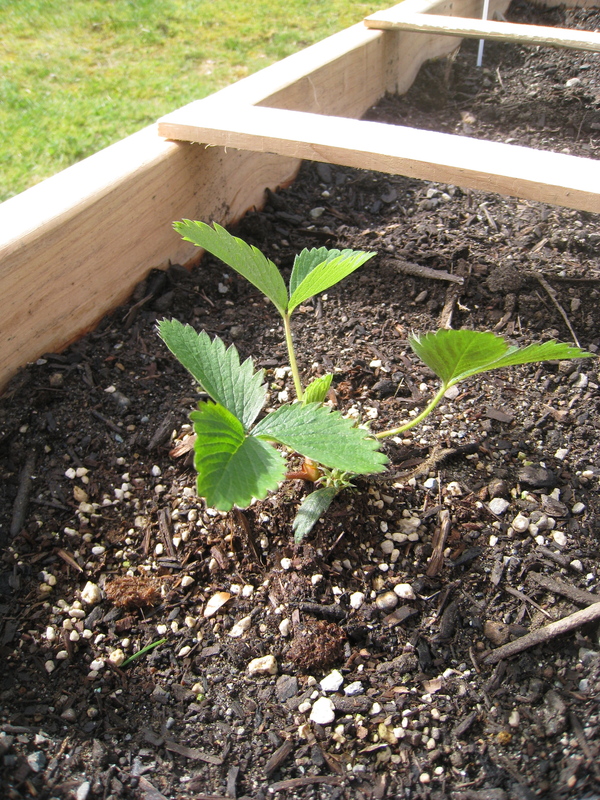 At the nursery last week, I couldn’t pass by some strawberry and brussels sprouts starts! The brussels sprouts spent a few days under plastic water bottle cloches when the weather was rainy and windy. They seemed to like it! 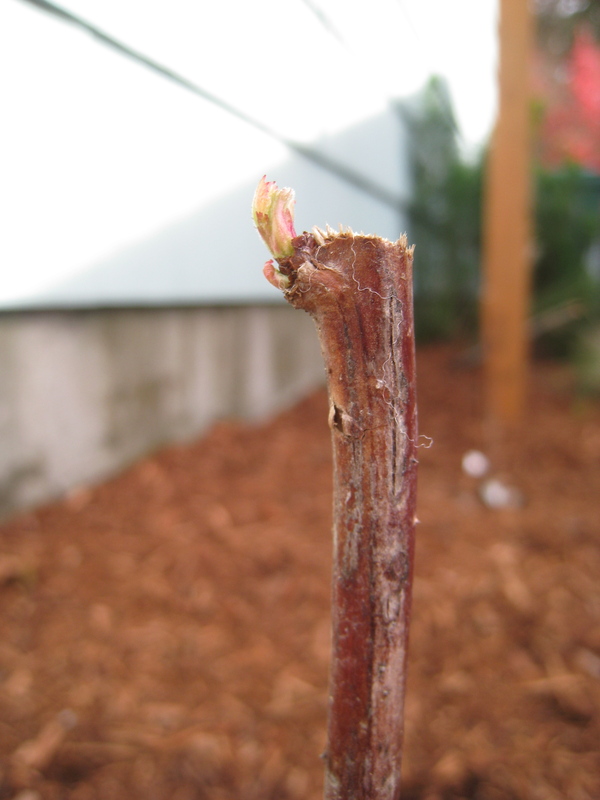 In raspberry news, the sticks are beginning to come to life – it was looking a little grim there for awhile. Thanks to the Artist, I discovered one of my favorite plants – Harry Lauder’s Walking Stick. I hunted for them last spring, only to find they are usually pretty expensive. Luckily I happened upon two at Home Depot, of all places, for $30 each! A screaming deal! Soon they will also sport some gnarly green leaves. Lots more fun green and colorful stuff to come next Friday, when the Lovely Miss Z and I hit Seattle Tilth’s Early Edible Sale. On the list, a fig tree! Maybe some bamboo and beets. Off to cook up some rosemary pork pasta AND try out the Nutella cheesecake! This entry was posted in garden and tagged garden by Chris. Bookmark the permalink. I just showed Ben your beds, we are so jealous! Ours will come soon as the wood has been procured. You are all planted and settled in. I CANT wait for the Tilth Sale.